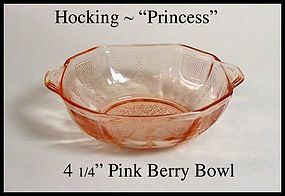 This pink Princess 4 1/4" berry bowl is in beautiful condition. It was made by Hocking Glass in the 1930's. We have 6 of these bowls available for $24.00 each.